It’s one thing to own a great vacuum cleaner, but even better to own an environmentally friendly one. That’s why Electrolux has designed a range of green vacuum cleaners with nature in mind: made with over 50% recycled plastic. These vacuum cleaners also combine power with extreme energy efficiency. Made with 60% recycled plastic, Powerforce Green comes with the Power Pro System - a combination of an energy efficient motor and our Dust Magnet Silent nozzle, which delivers excellent cleaning performance across all floor surfaces. With a AAA energy efficiency rating, this bagged vacuum cleaner uses 60% less energy compared to a standard 2100W vacuum cleaner. Made with 65% recycled plastic, Ergorapido® Green is a 2-in-1 vacuum that combines the ease of use of a stick vacuum with the convenience of a detachable hand-held for effortless cleaning of furniture and shelves. Featuring a high-performance 18V lithium battery with up to 45 minutes of run time (depending on floor type and cleanliness of filter), Ergorapido® will change the way you instant clean. Made with 55% recycled plastic, Silentperformer™ Green is one of our quietest vacuums, thanks to the Silent Pro System™, which features an energy efficient motor and our Dust Magnet Silent nozzle for quieter cleaning without compromising performance. 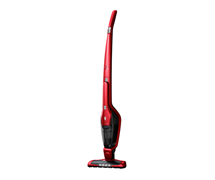 With a AAA energy efficiency rating, this bagless vacuum cleaner uses 60% less energy compared to a standard 2100W vacuum cleaner. Take advantage of Electrolux Platinum Service when you purchase an Ergorapido™. Platinum Service is a free premium offering to enjoy a number of benefits. Enjoy peace of mind with access to a dedicated team of experts, and a new product replacement warranty in the unlikely event of a major fault (T&C's apply).